Once a person grabs onto and takes possession of an idea, the rationalization process begins and the idea will quickly be seen as the greatest thing since sliced bread. Even if the idea is not feasible here or now, it can be very difficult to see reality and, if necessary, to let go. Filtering raw ideas and starting an idea garden helps prevent blind faith from leading you down an inappropriate development path. 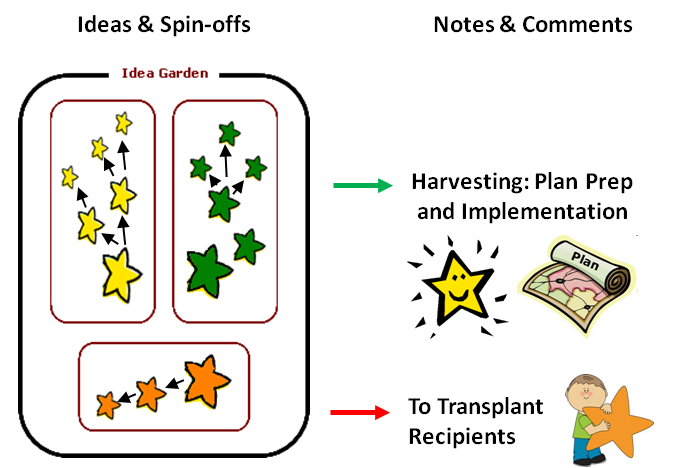 An Idea Garden is a simple process for recording and planting ideas so they won’t get lost or forgotten. We all have ideas pop into our heads from time to time. We remember some ideas, but most simply fade away. 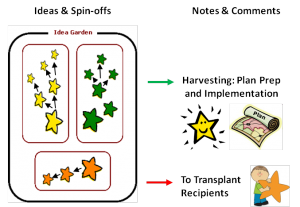 Then, every so often, we encounter a situation where we find ourselves saying “What was that idea?” Creating an idea garden helps us keep track of good ideas and prevents regret. Creating an idea garden can be as simple as using a large piece of paper (11” x 17” or poster paper) and post-it notes to record and plant ideas. Ideas and their spin-offs—which are often more feasible than the original idea—can be easily sorted into categories. Some ideas will grow as information becomes available, others will remain dormant and some will fade away. Highlighters of different colours can be used to indicate the ideas that show promise or grab your interest more than others. Ideas that don’t appeal to you can be weeded out, or transplanted into someone else’s garden. When an idea ripens, it is ready for harvesting and detailed planning. If the plans look good, implementation can begin when the timing is right. Principle: Never, Ever Implement a raw idea! This short presentation (see link below) illustrates how to use three filters to cull raw ideas and how to create and use an idea garden.